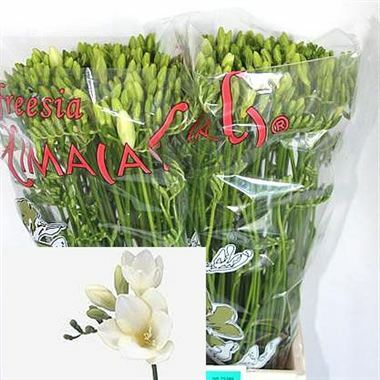 Freesia White River is a white single flowering variety. Stem length approx. 56cm. Wholesaled in 50 stem wraps. Freesia are grown from a bulb called a 'corm' and are the genus of the Iridaceae family. Originally native to South America, freesia have tall, thin spiky leaves and a one sided cluster of trumpet shaped perfumed flowers. Due to their beautiful scent, freesia are not only produced for the wholesale flower markets, but also to be used in the production of hand cream, shampoos, perfumes etc.